Raiders officials revealed the first renderings of the team's planned Henderson headquarters and practice facility to a committee last week. Initially, the team is planning to use just over half of the 55 acres it bought from the city for their headquarters and practice facility. In documents presented to the city, the team said the color and design of the headquarters is meant to mirror the stadium being built just a few miles away, as well as the Raiders iconic colors. Behind that exterior though, The team is planning to have a three-story office building for all the team's employees. When it comes to the fan and player experience, the team is building a 130,000 square foot field house. that will be home to one and a half indoor practice fields. There will also be an attached workout facility with gym equipment and an outdoor pool. The outdoor fields also include plans for bleachers on both sides. The team also says the practice facility will have parking for about 400 people between team employees and fans. 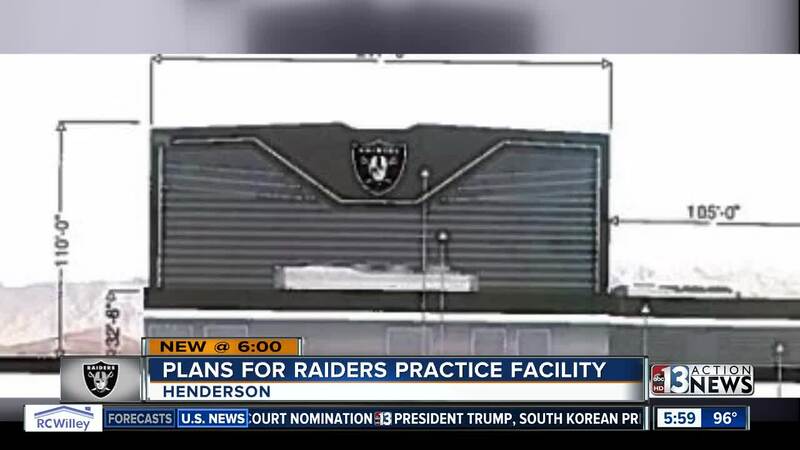 While we are getting our first look at those plans, it is still unclear when the raiders could break ground on the Henderson facility as the plans are under review.